This test measures water content, LOI, and density all from the same test specimen. It should be done using small samples which are big enough to stamp and write weights on, but small enough to be able to weigh on a scale designed to provide the ability to suspend objects under water. Density is measured on the principle that water buoys up an object by a force equal to the weight of the water it displaces. That means the difference between the weight of an object in air and under water equals the weight of the water it displaces. Since water weighs 1 gram/cc, the difference is also the objects volume in cc. L.O.I. is expressed as a percent loss in weight. This figure is derived by preparing clay bars, drying thoroughly above the boiling point, weighing, firing past sintering, (about cone 04) then weighing again, and calculating the percent loss in weight. This loss in weight can be due to organic material in the clay (coal, wood etc), water of crystallization, and the liberation of various gases by chemical processes taking place on heating. Different types of clay minerals have different LOI's. (ie. Kaolin loses 13-15% of crystal water) A typical L.O.I. for a native pottery clay is between 4 and 8%. If the bulk of weight loss is from coal and carbonaceous matter, problems like pinholing, pitting of the surface, and black coring in reduction can result (black coring causes weakening and changes in thermal expansion). Ball clays are commonly high in carbon and organic content. Keeping an eye on LOI helps to note differences in mineralogy, likelihood to pinhole or bloat, and tendency to produce fumes during firing. It is best to intermesh the procedure for this test with the SOLU and SHAB tests, making the specimens for each at the same time. Related information on the theory, purpose, procedure and interpretation for this test is available in the Magic of Fire II book. Enter the weight of the freshly prepared sample. This should have been written on the sample when it was made. Enter the weight of the sample after thorough drying. This should be written on the sample in ceramic pencil. It is important that the specimen be dried for several hours in at 100C+. Failure to do this can easily result in 0.5% errors. Very fine clays (i.e. mix of 10% raw bentonite with 90% calcined bentonite) can have a water content of 40%. Coarser clays will have good workability at 18-20%. Enter the weight of the specimen after firing. Specimens must be fired to a consistent temperature, i.e. cone 06. Enter the weight of the specimen after it has dried after being immersed in a liquid the will prevent water absorption during weighing under water (i.e. silicone sealant, wax emulsion, brick or concrete sealer). Enter the weight of the sample under water. When weighing, be sure the scale is zeroed, the sample is completely under the surface, and no air bubbles are trapped on its lower surface. SHAB test bars, an LDW tester for water content and a DFAC test disk about to be put into a drier. The SHAB (shrinkage-absorption) bars shrink during drying and firing, the length is measured at each stage. 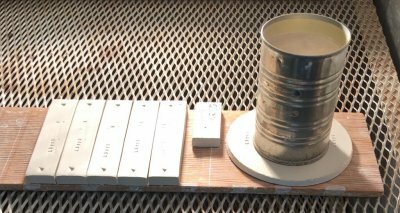 The LDW sample is weighed wet, dry and fired. The can prevents the inner portion of the DFAC disk from drying and this sets up stresses that cause it to crack. The nature of the cracking pattern and its magnitude are recorded as a Drying Factor. The numbers from all of these measurements are recorded in my account at Insight-live. It can present a complete physical properties report that calculates things like drying shrinkage, firing shrinkage, water content and LOI from these measured values.